Confessions, releases, statements, conversions, women, parenting and more! Confessions of an ex-skeptic - Or rather, a cynic. Obama released the long form - Will that make any difference to the Birthers? Presidential facebook statement - Hints at Obama not being religious. What would it take to convert/deconvert? - An act of God? Editor’s Choice: Women skeptics - A not-so-simple question, it seems. Science-Based Parenting — With the almost sudden gaggle of babies popping out of family and friends (at least three over the course of the year), I thought I would give this site a shout out. The blog covers book reviews, the low-down on vaccinations, cell phones and children, raw milk and many other subjects that should be of interest to new and not-so-new parents. Argument by Repetition — Any time a child wants something and asks for it repeatedly without regard to the fact that her father has said “NO” and stated his reason. This fallacy typically occurs when an ice-cream truck pulls into the cul-de-sac or when the family is at the toy store exit. Argument by Whining — This is a fallacy that, left unchecked, will slowly melt your brain away. Although similar to the Vicious Circle of Persistent Questioning, this fallacy is differentiated by the elongation of diphthong vowels at the end of sentences. There’s typically a rise in annoying inflection, implying demand, but then a dip in tone, implying a need for sympathy. A parent can tune this fallacy out so that it sounds like the distant melodic gasps of a lone accordion. We are not scientists. We are science-based skeptics. The purpose of this parenting site is to promote quality science and refute different types of speculative claims such as the supernatural, pseudoscience, alternative medicine, and any other extraordinary claim that contradicts facts established by science and/or reasoning. We’re happy to have differing opinions here, so long as the language is mild and the arguments aren’t entirely ad hominems. We have opinions about various beliefs, and those opinions, by their very nature, might offend some people. That being said, we reserve the right to delete any nonconstructive comments from trolls. Other than that, we welcome debate and discussion, and in the spirit of the blog, we’re happy to make corrections to any factual errors. So there you go. A whole blog site dedicated to parenting future critical thinkers! I’m glad that I don’t have to do the parenting thing anymore, but I’m sorry that a site like Science-Based Parenting wasn’t available to me back there when I was. Contributing SFN writer Michelle Shires’ new baby, Maisie Rose. Wednesday: Chat was unusually slow this week, but started out with playing the stock market, then evolved into a discussion about Trump and the released birth certificate. Some medicine got mentioned before the chat turned to the best rock songs through the ages, and why it’s hard to sing in tune. Revolutionary Deists: Early America’s Rational Infidels, by Kerry Walters. “For some eighty-five years — between, roughly, 1725 and 1810 — the American colonies were agitated by what can only be described as a revolutionary movement. This was not the well-known political revolution that culminated in the War of Independence, but a revolution in religious and ethical thought. Its proponents called their radical viewpoint ‘deism.’ They challenged Christian orthodoxy and instead endorsed a belief system that celebrated the power of human reason and saw nature as God’s handiwork and the only revelation of divine will. In this illuminating discussion of American deism, philosopher Kerry Walters presents an overview of the main tenets of deism, showing how its influence rose swiftly and for a time became a highly controversial subject of debate in the colonies. The deists were students of the Enlightenment and took a keen interest in the scientific study of nature. They were thus critical of orthodox Christianity for its superstitious belief in miracles, persecution of dissent, and suppression of independent thought and expression. What would it take to convert/deconvert? Bills planned to legalize abortion murders?? There were 7,361 daily visitors this week. 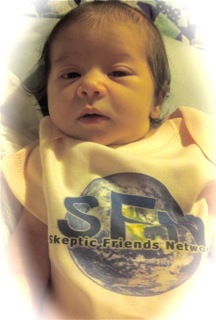 The Skeptic Summary is produced by the staff of the Skeptic Friends Network, copyright 2011, all rights reserved.